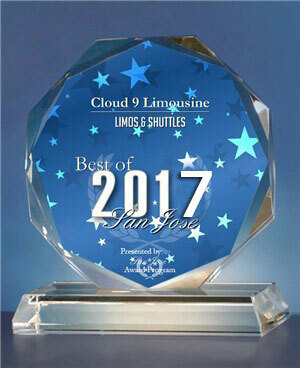 Cloud9limousine.com has been serving bay area for decades. We are locally owned and operated and licensed by the state of California as a full servicelimousine and transportation company specializing in providing affordable bay area luxury limos and chauffeured ground transportation to the bay area and northern California. Cloud9limousine sepcializes in Personal, Corporate travel, Weddings, Prom, Quinceaneras, Sweet 16, Night on the Town, bay area wine tours, bachelor parites and much more. Cloud9Limousine has a vechile fleet to cater any occasion large or small, we have but not limted to Lincoln Towncar Sedans, 8-10 passenger stretch limousines, 20 passenger super stretch party Hummer limos, executive SUV’s, and Vans. We are fully insured and have a large selection of the latest models stretch limos & corporate black limousines. We are the first one to offer H2 Pink limo. If you’re in need of airport transportation to or from San Francisco airport (SFO), San Jose airport (SJC), Oakland airport (OAK) or any major airport in the bay area, our sedans, limo bus, luxury limos are equipped to meet your needs. Ask about our affordable airport Van Service. We do not offer bay area Taxi service, however you may find our Towncar (sedan car service) Rates more affordable than a metered taxi fare. Cloud9limousine.com is the leading limousine and transportation service company in Santa Clara, Sunnyvale, Mipitas, Fremont, Pleasanton, Livermore, San Ramon, Santa Cruz, Los Gatos, Saratoga, Gilroy, Morgan Hill, Palo Alto, Mountain View, Monterey, Napa, San Francisco, Oakland, Danville, Castro Valley, Livermore, Dublin, Haywardand throughout the bay area & northern California. 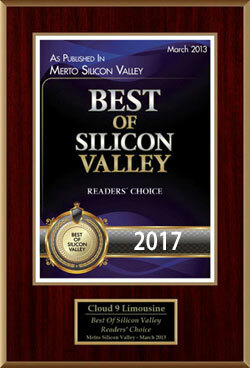 Cloud9limousine Specializes in car services and limo transportation in the bay area, California. Your complete statisfaction is our goal. Our staff is fully committed to meeting and exceeding your expectations. For our executive travelers, rest assured Cloud9 Limo & Limousine rentals is geared to meet your personal and professional transportation requirements, so that you can conduct your business smoothly and efficiently. For the weekend "Nights On The Town leisure Limos" customers, we have a Luxury Fleet of H2 Hummers, Limo buses, SUV limos, Stretch Lincoln’s Limo, Sedans, Vans, Towncars, Mercedes and more. With an extensive line of luxury vehicles available for any occasion in the bay area, we have your transportation need covered. Our first-class fleet holds multiple limousines, sedans and party limo buses including Mercedes, Towncars, Hummers, 6 – 10 passenger limousines, 18 – 22 passenger SUV limousines, passenger vans and Limousine Buses. At Cloud9limousine.com, our dedication to quality service will more than exceed your expectations. Our commitment to safety and customer satisfaction is unsurpassed in the transportation and limousine service industry. We keep our fleet in top operating condition in addition to pur every day low limo prices, limousine package deals and limo specials. Ask about our 10 passenger limousine specials, 20 passenger party Hummer package deals, low hourly limo rates and multiple limousine rental discounts. Call us for any special requests and free limo quote 24/7, our customer service representatives will be happy to answer your questions, provide details about the limousines you’re interested in renting and even help you plan your celebrations and events in the bay area from A to Z.